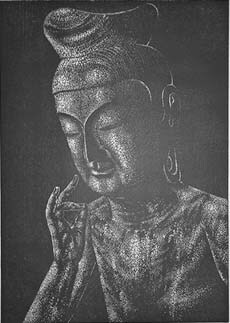 Eikan was training the Buddhism in Amida-dou. 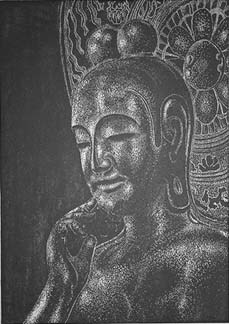 The training of the Buddhism of staying up all night became the latter half, too. 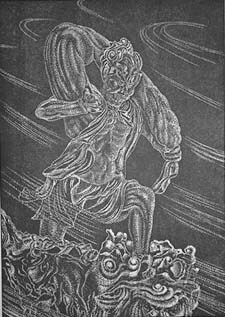 The light of the candle sometimes projected Eikan's appearance in a frozen temple. The sign of something did suddenly. 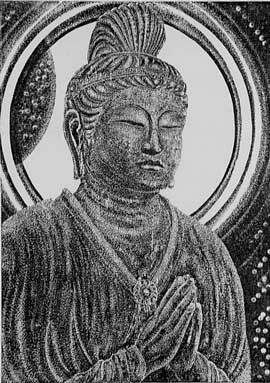 Amitabha Buddha of the principal image got off the buddhist altar. 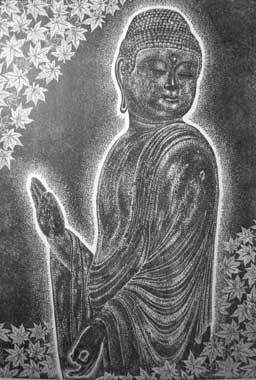 Amitabha Buddha began to walk in front of Eikan. 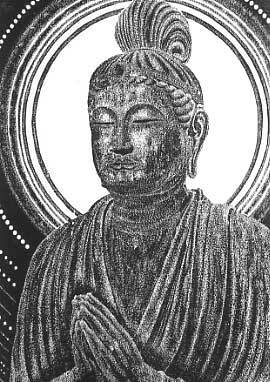 Amitabha Buddha twisted the neck to the left, and saw Eikan. MIKAERI AMIDA 2 is the percentage of completion of the 90%. While there is a feeling of strain to a fingertip, the hand of joining the palms together gently symbolizes an eternal prayer. The palms are joined together by seemly features and people are earnestly charmed by the beauty of a mystery. The figure to pray is filled in dignity, smiling faintly. Although it has shone to lacquered black and this blackness that got wet had become the attractive beauty of this image, it was a beautiful vivid color image at the beginning of work. German philosopher Jaspers also extols. A quiet smile is carried out and it considers forever. All the whole body is beautiful. The most beautiful part in it is hidden in the right fingertip. The point of the middle finger with which it is going to touch the right cheek lightly and which felt relieved, and the beauty of the third finger bent lightly are spoken to forever to us the human beings. Popularity is NO1 in Japan. 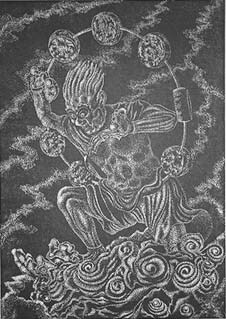 God of wind and God of thunder have achieved the duty which protects and helps this Kannon and its believer according to Kannon with 11 faces and 42 hands with God of 28. 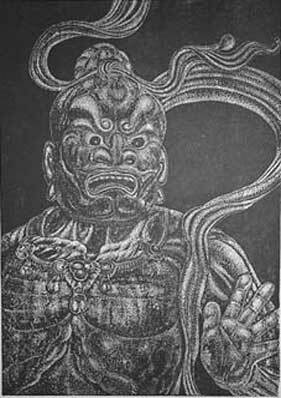 It is thought that following Kannon with 11 faces and 42 hands is based on faith that this Kannon governs the weather and rain water. God of wind flies about a heavens top. A mouth in a bag is opened and a big wind is sent to a lower community. God of wind is blue God painted green. There are four fingers of a thick hand. There are two fingers of a leg. God of thunder sounds eight drums with a stick. A roll of thunder is sounded on the ground. God of thunder is red God. There are three fingers of a hand. There are two fingers of a leg. 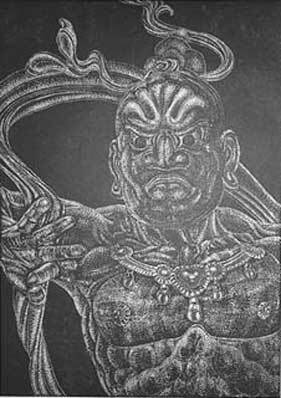 standing image of Kongo-wrestler is expressed to "a-shaped" which opened the mouth, and "n-shaped" which closed the mouth. "a-shaped" is the first sound which opens and pronounces a mouth. "n-shaped" is the sound of the last which closes and emits a mouth. i.e., beginning and the end of things, is expressed. It uses for the meaning which calls it "breathing of 'aun'" again and succeeds with a partner.